Machi Koro is a game of disappointment. I first heard about it a couple of years ago, and it was being touted as the next great “filler” game. A short, easy to teach, easy to play game with interesting decisions. Everywhere I looked online people were talking about it favorably, so in my next game purchase I picked it up. In a bit of foreshadowing, the experience upon opening the box was underwhelming. It’s a small box with quirky artwork on it, but inside was a small deck of cards and some money tokens. This is one of the most egregious wastes of box space I have ever seen. The game looks pitiful in there. I estimate the box is about 10 times larger than it needs to be to fit the game. 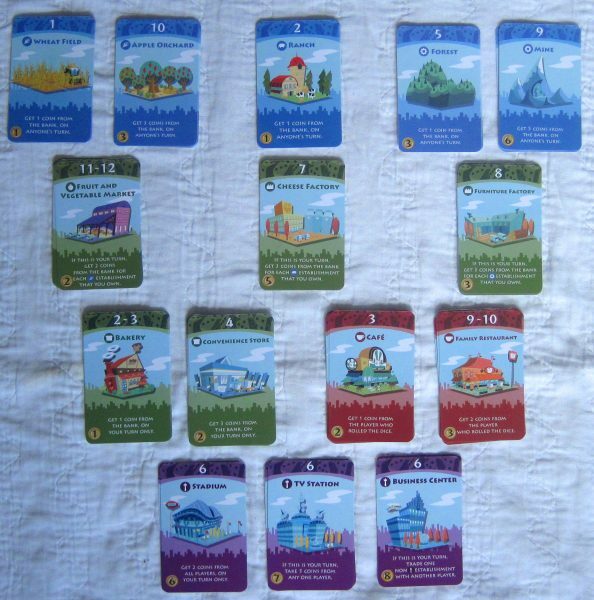 Anyways, Machi Koro is a Japanese tableau-building game that borrows the dice mechanism from Catan. You begin the game with a couple of starting cards in your tableau, and there are cards in the middle available for everyone to buy. Additionally, everyone has 4 face-down “advanced” cards in front of them with increasingly expensive price tags. The first person to buy all 4 of those cards wins. Each turn the active player rolls a die, and everyone collects money based on that die roll. The active player can then purchase a single card from the middle of the table if they wish. It’s very simple, and conceptually sounds good. There are a number of different types of cards available for purchase. Some give you money when you roll the number printed on them, some give you money when anyone rolls that number, and some let you take money from other players. Again, an interesting concept. It’s a good idea to have cards that activate during other people’s turns to keep all players interested when it isn’t their turn. However, the problem is with the cards themselves. In short, there are very clear dominant strategies that will almost always win. These aren’t particularly complicated strategies or ones that require a lot of skill or expertise to master. They’re fairly obvious and anyone who has any experience with modern board games will pick up on them within the first couple of plays. There’s not really any counterplay to them either. Since it’s a mostly non-combative engine-building game, whoever creates the best engine will usually win. The only way they won’t is just through the blind luck of the dice rolls. This problem is exacerbated by the fact that there is no variety in set up. You will be using all of the cards in every game. From what I understand, the Harbor expansion solves this issue, but I personally don’t want to spend the money on it when the base game is this flawed. This is so much of an issue that if you are interested in Machi Koro, I would seriously consider immediately getting the expansion. Furthering this problem is the fact that the game’s pace is very anti-climactic. Due to the way the game pays out money, once someone has established their tableau, they just need to wait for one of a few good dice rolls for them, rake in tons of money, and then buy the cards necessary to win. In other words, if one were to graph the game’s pace it would look like the business-end of a hockey stick. At the beginning you’ll occasionally get a coin or two. Sometimes you’ll get stuck with multiple bad rolls on your turn in a row and won’t be able to do anything at all a few times. Eventually you’ll start to buy cards, which will give you money, which will allow you to buy more cards, and then someone is going to hit their big turn and either end the game right there or set themselves up to win the game very soon. There’s nothing you can really do about it, and it’s startlingly abrupt. The game takes longer than it should to ramp up to the point where you’re consistently getting enough money to buy a card on your turn. The middle game, where you’re settling on your strategy and racing to get the cards you want before the pile disappears, is the most fun part of the game. But it’s over all too soon and the end game is sudden and unexciting for everyone except the winner. 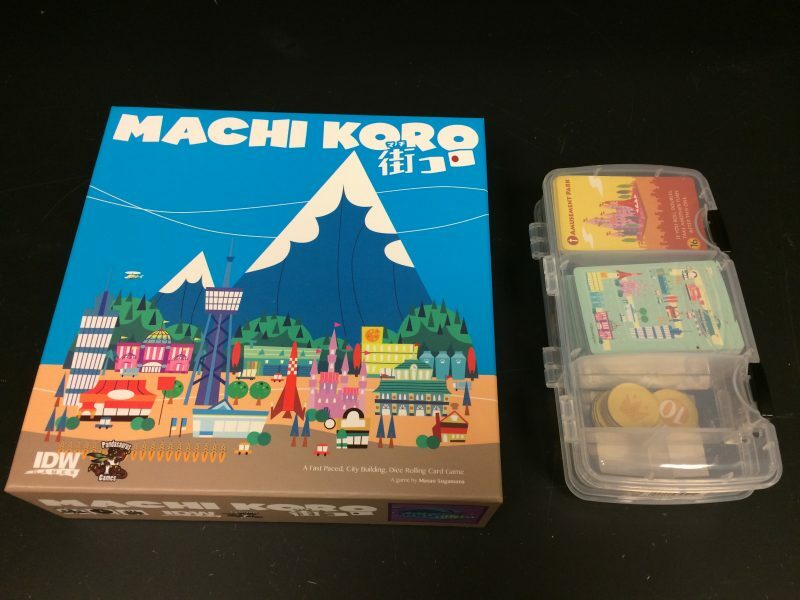 That said, the art is very nice, and for those kinds of gamers who just want to roll some dice, relax, and not think very hard, Machi Koro might be worth picking up. The game flows quickly, and it always feels nice to roll some dice and collect money for half an hour. But the moment you get competitive, the entire game crumbles apart in your hands. I don’t really care to play it anymore, and I definitely don’t want to look inside that box and see its cavernous emptiness.